The rains were lashing the mountains, the wind howled around the cliffs, the ominous dark clouds hung around low, a precursor of the unknown future. ...Nothing happened except for Brown Rice Khichdi in my pressure cooker. The Khichdi man of the house aka D was in charge of the kitchen. So when he said he wanted to make “Khichuri”(there is a recipe of khichuri down in that post) I thought why not, could send this on to JFI. To add a twist to the tale, I asked him to use brown rice and of course he flatly refused, declaring that Brown Rice does not a Khichuri make and some such fundae. After much cajoling I asked him to browse the blogs for inspiration. Some amount of time pass and Googling later, he finally declared he DID have a brown rice khichdi recipe, blogged by some Punju Scientist girl. Of course I knew it was none other than our dear Musical and her Khichdi. So brown rice Mothaan di Khichdi was transformed to the Bengali Khichuri with Brown rice and also loads of other veggies like cauliflower, potatoes, tomatoes and what not. 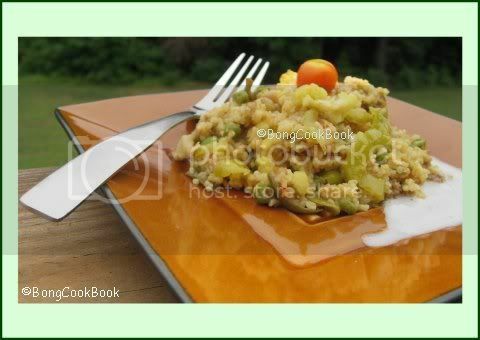 D followed Musicals' recipe (he says) but used green Moong and Red Masoor instead of Moth, he added veggies which is usually added to a bengali style khichuri, also he tempered it the bengali way. It was delicious to say the least. Next time he makes it, I will surely try to scribble and update this post for my own good. Two of my dearest friends, Indosungod of Daily Musings and Sia of Spice Corner has sent two lovely awards my way. Thanks to both of you, you are the greatest. Thanks to Bharathy , I just saw she passed on one too. There is a downpour now it seems. I would really like to pass this on to everyone who takes time to visit my blog, leave their comments, encourage me, discourage me and make me feel so much at home. 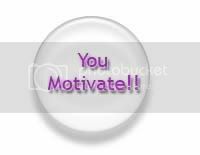 But then most of you have already been awarded this for the wonderful bloggers that you are. Now an award for bloggers who inspire, who make you cook when you don't want to, who force your hubbies to cook weird stuff, the Motivational Blogger award for Coffee and Musical (on the aside, I am doing this under duress). I would also pass this on to Jugalbandi because they really inspired me to blow up an egg in the MW today, I am doing it for sure. Update: While I am online searching for good lobster places up North before I have even started the journey,and what do I do, but check Blogs.And so I see one more award comes my way from lovely Mandira whose blog was one of the few that inspired me into blogging last year. Thanks Mandira and yes I do Think a lot, as in "Think what I am going to eat next"
Since these awards are only for bloggers alone I am not able to pass them on to many non-blogger readers of my blog, whose comments really encourage me, it makes me happy if I have touched their lives in some way and I would really like to say a warm Thank You. 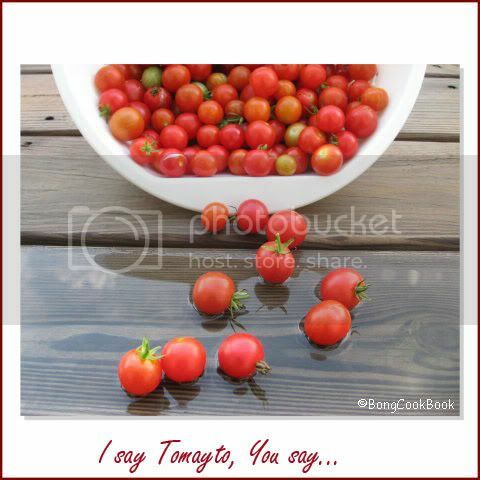 I am no great cook, but I find happiness in food and through my blog I try to present a snippet of a life, memories, hopes intermingled with cooking. I want my daughter to have a childhood embroidered with smell of home cooked food so that she can have memories like this when she is alone out there in the world. And so I Thank all of you who take precious time to come and visit and let me continue weaving memories fragrant with the smell of food. I never thought I will make Luchi again and that too in such rapid succession. But with all the deep-frying going on in Blogosphere I was really very hungry. Still, I restrained myself until Coffee came and commented (on my last post) that she thought the Puri I was talking about was Poori. The fact that a 3 year old would be thrilled by my decision helped. So I made Luchi again, this time with Alu Charchari. Here's my Luchi-Alu Charchari joining the Independence Day party at Anita’s. Though the Luchi with Alu-Charchari was absolutely yum and the 3 year old had hers with some Maple Syrup too (instead of khejur gur ? ), I tell you I am not going to do this again in the near future (which means next month and hope D doesn't read this). Not because it’s going to clog my arteries (What Rubbish!!!) nor for the deep frying smell (which I love) but simply because it’s too much work for me. Really it is. There is no limit to the number of Luchis I make, they simply disappear as soon as I take them out of the oil. So I go on making them endlessly all the time eyeing them hungrily hoping to get this task over and hog on them, this wait totally stresses me out. Also the Luchi dough has a considerable amount of shortening so rolling out the luchi is not a very easy thing for me. Next, rolling out the luchi and then frying them at the same time calls for a certain amount of finesse which I woefully lack. So I roll some and then heat the oil and due to my lack of patience half of my luchis don’t puff up well. Though I am all in favor of making Poori/Luchi the national and even international dish, by if not making it every week at least by voting for it million times. Here is some Luchi Guide I have come up with which might help the future generation. For 3 cups of flour 3 tbsp of oil is suggested as mayan or shortening. 2 tbsp works fine though. 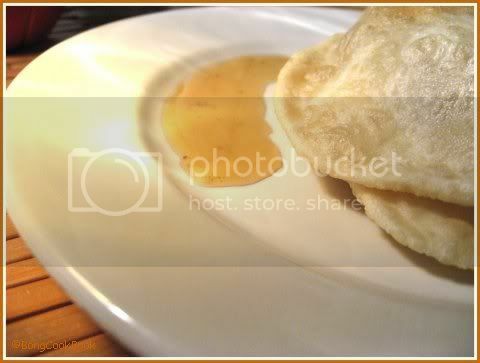 However if the mayan or shortening is very less the luchi is not soft as it is supposed to be. The Luchi dough needs to be worked well, this is called “thasha” in Bengali. You need to knead the dough for sometime till you get the smooth end result. The best time to knead the dough is when you are very very angry, kneading vents your anger, therapeutic I tell you. After making the dough, cover with a lightly dampened cloth or kitchen tissue and let it sit. After half an hour or so proceed to make the balls. (If I refrigerate the dough, after taking out from the refrigerator I just knead it once more with a light sprinkle of flour) Rolling out luchis now is easier. Use oil and NOT flour to roll out luchis. Eat it hot, don't ever have a cold luchi. Ok you can, when it is part of Pujor Bhog or leftover from your friend's wedding party or leftover from any party if you are a grad student. 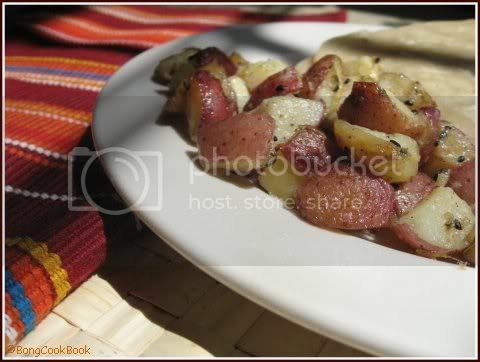 The Alu-Charchari is the quickest, tastiest aloo ever, it is very very simple. Temper with Kalonji/Nigella Seeds and freshly grated ginger. Add the green chillies when you are half way and continue, cover, stir, cook routine till potatoes are done. But this is really a tale of One Spice, the all famous Mustard and not only two different fish but two very different fish recipes, one from my own state Bengal and the other from the neighboring state Orissa. Orissa is close to Bengal, not only in miles but also to people’s heart, the main reason being Puri of course, which is not only a place but an integral part of the Bengali culture. Every Bengali director has a tear jerking Bengali movie to his credit, with visuals shot in Puri, every Bengali Writer has characters in their work of fiction who go and visit Puri at least once in the span of the entire book, every newly married Bengali couple had their honeymoon in Puri before Mauritius came into picture. A Maestro like Satyajit Ray too had many of his short stories set in Puri which surely proves something. Though I love fish, I absolutely refused to see the sunrise at any of these places. Vacation for me does not mean getting up in the crack of dawn to see a star rise because a planet is rotating. 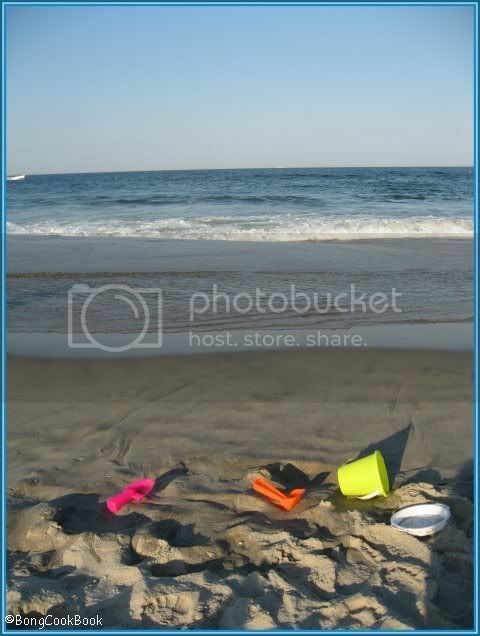 I was duly chastised for my impudent behavior I remember and my parents were forced to go to the beach without me budging an inch. Though it has been really long and I don’t remember any specific food from that time, I do remember the Mishti Wala (the sweet seller) who would come to the Puri beach with a pole balanced on his shoulder and two huge aluminium pans hanging on the two ends. These aluminium dekchis(deep round pans) had sweets which we used to gorge on every evening sitting on the beach. Again I cannot recall what those sweets were (chanapoda ?) but I remember him going “Dhai Kiri Kiri” as he rushed catering delicious sweets to his sweet loving customers. I think “Dhai Kiri Kiri” meant “move fast” or some such thing, but it has been a favorite adopted term in our house since and we use the term often. While looking for an Oriya recipe I found that there is a lot of similarity between Bengali and Oriya cuisines. 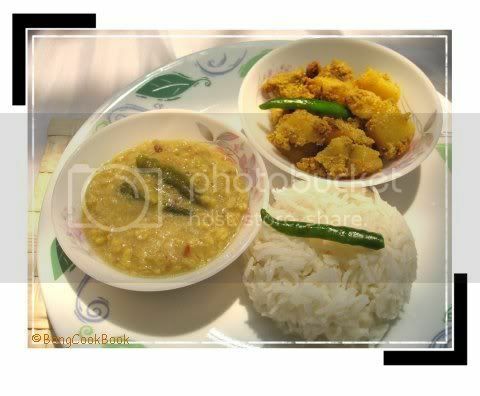 I wanted to try an Oriya dish which is not typical of Bengali cuisine yet had a bond with it. So I had to choose something which had...you guessed it right...Mustard. 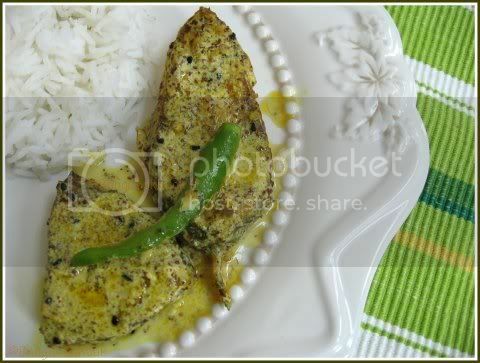 Now the first recipe of Doi Ilish today is the Bengali one with Hilsa in a Yogurt based Mustard Sauce. Hilsa or Ilish Mach is such a great tasting fish that cook it any way you want it will taste nothing but great. I got this recipe from my Bengali Recipe book. 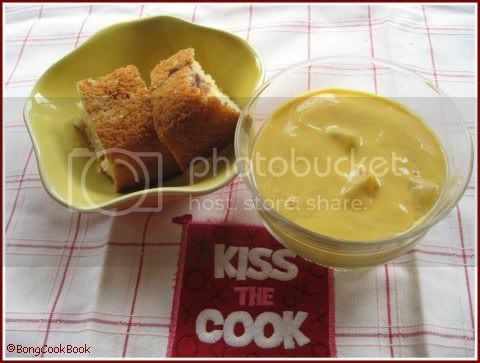 I added more mustard paste than the recipe called for but I am putting up the recipes as in the book. Also since I get frozen Hilsa here I fried the fish lightly. The original recipe does not ask for fish to be fried. And then I came across Machha Besara, an Oriya dish of fish in mustard sauce. What interested me was the recipe had asked for mustard to be ground with garlic and green chillies to make a paste. 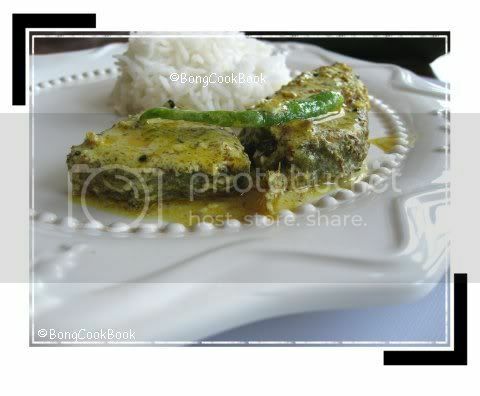 Now in a Bengali recipe, mustard paste or shorshe bata is a wet paste of mustard with green chillies and no one can even imagine adding garlic to the paste. 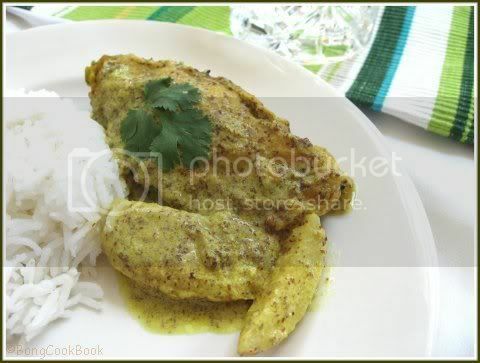 Second was the use of potatoes in a mustard paste based fish dish, another thing very different from a Bengali Recipe. I decided to give it a try and was pleasantly thrilled and even D (not a fishy bong) liked it. I used Tilapia (fresh Tilapia cut in steak size pieces) for this dish and I would implore all Bengalis to try Machha Besaara at least once, it would be a very different albeit beautiful mustard experience. In a bowl mix the yogurt with the mustard paste. Discard the fishy oil if you wish and heat some fresh oil. With hilsa however the mustard oil in which the fish is fried holds a special value for most Bengalis and we dare not throw it out. Heat oil now, for tempering. Temper with kalonji and green chilies and wait for the spices to pop. Add the fresh ginger paste. Mustard-Garlic paste ~ Soak 2 tbsp of mustard in water for 15 mins. Then make a paste with juice of 1/2 lemon, 2 green chilies and 2 cloves of garlic. Again add some more oil in the heated pan & add pancha phutan & green chilies. Add the mustard paste, turmeric and salt. Let it simmer for 10 minutes. Add 1 cup of water for the gravy and let it simmer. Add little sugar to taste. --Into that heaven of freedom, my father, let my country awake. And now comes the award, no not the Bharat Ratna Award silly, the Rocking Award. Sra passed me this and I first thought may be she meant my blog had hit rock bottom and so she wanted to throw rocks at me. But the logo looked nice in pink & had a star, now anything in pink can't be bad, can it ? Also Sra is one of the few early bloggers whom I bonded with over comment space and I have seen her go from greenish-yellow to pristine white, I know "When" her soup came alive, I know that she is a conscious and innovative foodie and that she rocks, if she is passing on something it's got to be good. I saw my blog mentioned at the CHOW. It was funny as I never thought of the "other bong" and also made me proud. Thank you all for having me here, your words make my day and Thanks Kara for finding me. Thanks to Mandira too and she knows for what !!! I got to tell you this, grumble as you might of mixing up little S in my recipes and stopping only from eating her as a sidekick (ahem side dish) to my recipes. Now as you all know “Reading” is sold highly as a virtue and all that among kids and so like all good mothers I started the routine too. But more than reading to her I would make up stories and tell her, even change the story in hand if the situation so demanded. As she learns to read small words I try to induce her to read books herself.Reading by itself opens up a whole new world as it did for me when I was a 5 year old. I still remember the Red hard bound "Everyday Stories" by Enid Blyton which Baba got me once I started reading english and thus had me hooked for ever. That and the Bengali Kids magazine Anandamela which I used to get every month showed me a way to a world of everlasting enchantment. So that S gets a hang of reading, we got her the “Dr.Seuss” which is brilliant if you think ease of reading but not really interesting when seen through the eyes of a 3 year old or her X year old Mom. So “Hop on Pop” does rhyme and also can be read but then what….nothing really happens…no story is spun…and so the 3 year old girl and the X year olds interest wane. The 3 year old however seems to be more interested in picking up a book and spinning her own story. 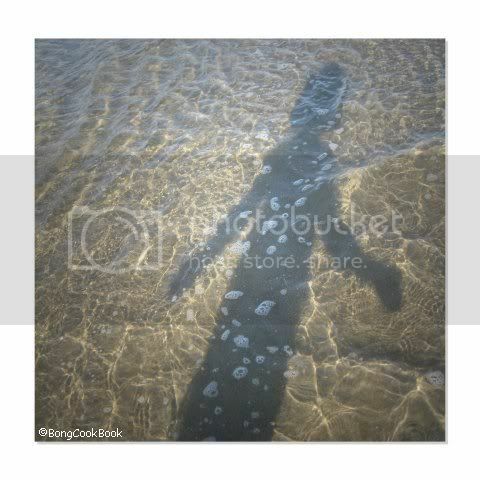 She does not really read the lines, but makes up a story on her own through the pictures and that enchants her. In all this she got hold of a thick pink Disney Princess Story Book Collection. This was a hand me down from a friend’s older daughter and I had slipped it away at the bottom of the chest which holds her books. Why did I do that? Because what if she asked questions like this I thought. “Why does the prince want to kiss Cinderella?” --- because she is very beautiful and also very good….Yikes. I figured once she can read on her own, she could do it. I am a psyched mother I tell you. Anyhow this little girl of mine found the glossy pink Disney Book one day and enamored by its prettiness strutted away with it before I could say NO. So I asked her read to me instead and this is what she came up with in the sing song voice a 3 year old usually has. Mind you S is perfect in her Bengali but her English is far from so and it’s really funny to hear. 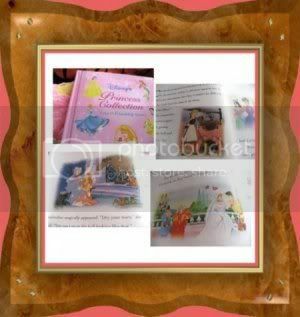 “Cinderella”… she started off, making up the story from the pictures in the pages. “Once upon the Time, Cinderella is very busy. She do all her work. She want to go to dance party so her mom scold her. Then her Grandma (the fairy Godmother in the book) gave her “sparkly-sprinkly” dress and a star clip. In the party she see her Daddy. Her Daddy say, Now we have to go home, Tomorrow is school. Cinderella break her shoe so her Daddy buy her new shoe. I wanted to roll on the floor laughing but obviously I had to show great interest and be sober so that is what Cinderella's story is for me now on. With such a 3 year old wrapped around my leg most of the time that I am home, I never get to finish my cooking in express time. I cook in bits and pieces, doing hazaar things in between. So maybe I will come home and put the Dal in the cooker, and then I will sit and paint with S and so though the Dal could have been ideally done in 20 minutes flat, I get back to do it only after an hour maybe. However to make things go faster I also do a lot of chopping etc. over the weekend or whenever I get time to ease the weekday. I usually have a cup of coarsely chopped onion, some fresh onion paste, and some chopped ginger & garlic in the refrigerator for impromptu weekday meals. If I am planning to make fish, I usually fry the fish pieces (we Bengalis fry the fish and then put them in the gravy) and then use them in a day or two in different gravies. Yesterday I was determined to time my cooking though for Mallugirl's Summer Express Cooking and asked D to entertain S while I just cooked. It was a very simple thing I made, simple but healthy, Daliya Pualo. My Ma makes this pretty often to pack as lunch, I do both for lunch and quick dinners. 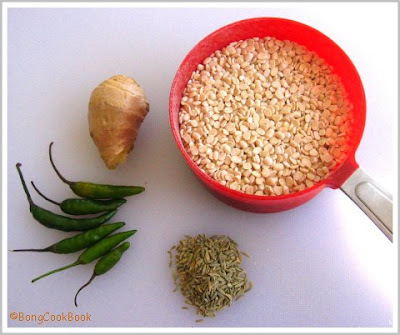 Daliya is Cracked Wheat that you can find in Indian stores. It is not same as bulghur but you can use bulghur too. I also thawed about ½ cup of frozen peas. While chopping, remember to stir the chicken too. Meanwhile the ground chicken will be done and the Daliya too. 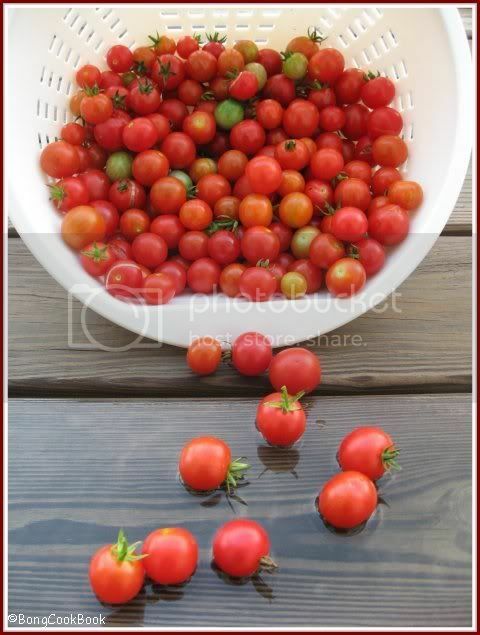 The veggies should be done by now. Add the cooked ground chicken and mix well. Throw in some golden raisins. Add salt. Now is the time to add the Daliya. If the pressure lid refuses to budge, put it under running cold water, this will release the steam. Add the Daliya to the Kadai gradually and then mix well. Everything done in 29 minutes and now you have one minute to reflect on what Douglas Adams said "Time is an illusion. 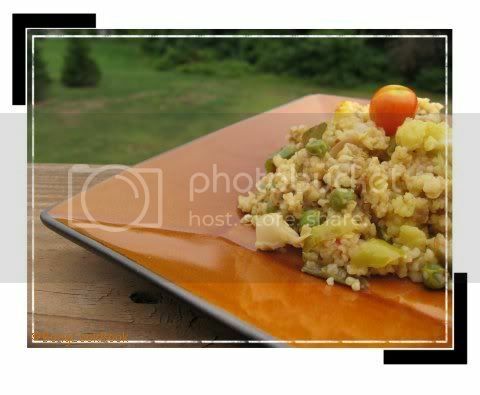 Lunchtime doubly so"
Trivia:Because cracked wheat is made from whole wheat berries, it carries a great deal of nutrition and fiber since it includes the fiber and nutrient rich outer bran and germ of the wheat. Sometime back I had to go to the city every day during the work week. Now unlike Bee and like Nabeela, I am not a city girl. Though we live a commutable distance away we hardly drop in to be a part of the city crowd. 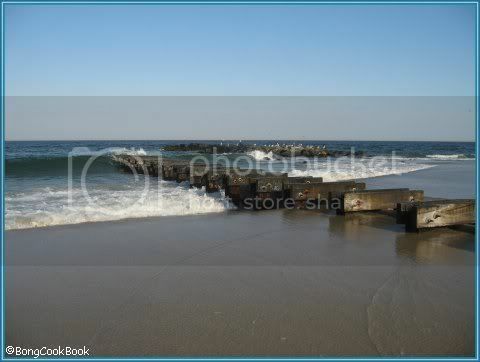 We are happy with our quiet green neighborhood and the proximity to the “Big Apple” has not rubbed the city life on us. However I do not grudge the rare trips I need to make. I like to wait for the bus on a crisp morning and also love the fact that I can get an hour & half sleep while in it. I think I sleep a pretty deep sleep on the bus with my mouth open and even softly snoring. It leaves me pretty refreshed, and I don’t think anyone minds because most of the bus is doing the same. Ok but this not about my sleeping habits so let’s not digress. The one thing I like about these early morning occasional ventures is the stores in the city. No, I am not talking of Saks 5th Avenue. I am talking of the small ineffable stores wedged between the tall structures, keeping a brave front, trying to hold on to their uniqueness of not being a part of a chain. I wonder what they sell. I see a sign saying “Lotto” and I try to peer through the thick bus window. I think I see a counter running through the length of the stores and I remember…. Yes, it reminds me of “Maulbi Saab ki Dukan”* just opposite to my school bus stop, my one stop shop for all my stationery needs for most of my school years. I remember Maulbi Saab in his checked blue-green lungi , white fez cap and almost luminescent white beard standing behind a counter that ran across the center of his shop. The counter kept the customers far removed from the merchandise and in turn gave Maulbi Saab an all encompassing power. I had to wait patiently for my turn for the Maulbi Saab or his grandson to be free and then I would ask for the Royal Blue Chelpark ink that I needed. I could not sample the Sulekha Violet ink if I wanted to or rummage through the crisp notebooks on display far from me. The limitations of these choices mad me satisfied with what I needed alone and taught me not to go looking for stuff beyond my needs. A lesson long forgotten when I hoard unknown boxes of spices and trifles, I don’t intend to use, just because I have an easy access to them. It's not that I don’t love the choices a departmental store gives me, I do love the independence. But when I madly rummage through the aisles of Wal-Mart looking for a particular Dora kiddie water bottle, a part of me still yearns for the green shuttered Maulbi Saab’s Dukan and the polite Maulbi Saab in his blue-green checked lungi and white fez and I wish I could just go up and say “Ek Dora Purple & Pink Water Bottle dijiyega”** and come back home happy. But lets go back to the Dal I made today. 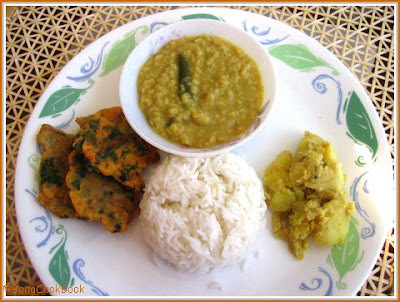 Kalai er Dal is a dal made of split white (skin removed) Urad Dal, very typically Bengali and also a favorite in many Bengali homes. Kalai er Dal with Alu Posto or Alu Seddho (mashed potatoes with a dash of mustard oil) is the best thing that can happen to you during a lulled summer afternoon lunch. Flavored with Ada-Mouri bata (a paste of ginger and fennel seeds) this sweet smelling dal can take two different avtaars. 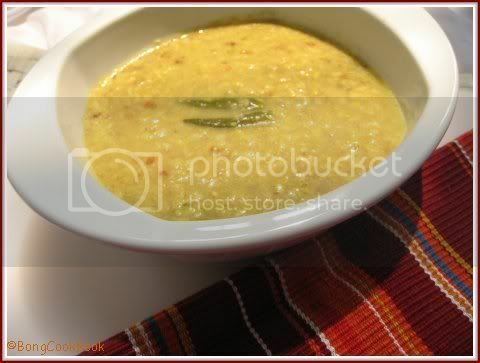 If you do not roast the urad dal and cook this Dal, it tends to get a bit slimy. Many people do not like the slippery texture though I loved it. If you dry roast the dal before you cook it though, the slimy texture is gone and you get the flavorful dal without the slippery feeling. This dal is best enjoyed with white rice. 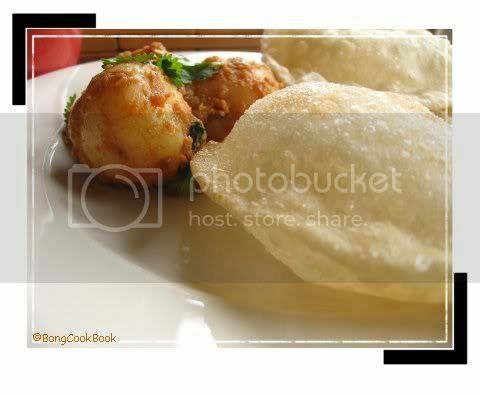 In a Bengali home it is served with alu posto or alu seddho and is typically served during a quiet lunch for the family. Usually not part of a menu for a larger audience it is for a quiet meal with the close family. Ada-Mouribata ( a wet paste of Ginger and Fennel Seeds) ~ 5-6 tsp heaped of the prepared paste. Bee's comment made me write this. The paste I make may yield a bit more than 6 tsp of paste. I usually make this paste and refrigerate it for later use, so follow the measure given for the paste while cooking. Dry roast the Urad Dal till you get a fine roasted smell and about 50% of the lentils turn a light brown. Wash the roasted Dal. If you do not want to roast it, you can skip this step. Pressure Cook the Urad Dal with almost 3 times the water and about 1/2 a tsp of Turmeric powder. When it’s cooked lightly mix it with a wire whisk Do not mash it up. It may take 6-7 minutes to get done after the pressure build up. This is not a very thick dal so check the consistency accordingly. Enjoy it with White Rice, Alu Posto and some Bhaja (Fried Veggie friters). 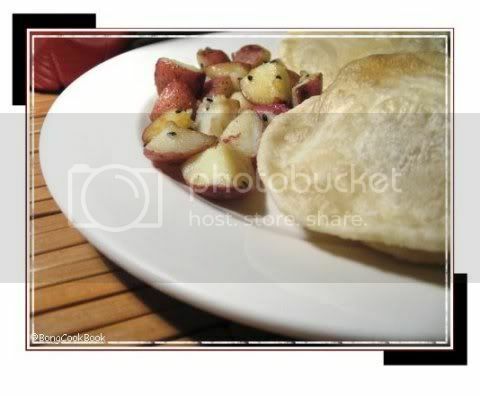 Alu Posto recipe is here. 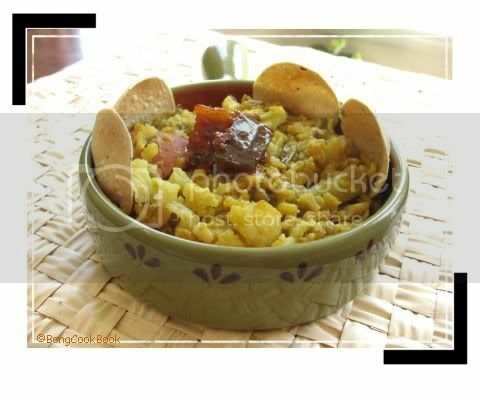 For the recipe of this Dal and more Get my book hitting the stores soon. Trivia: Urad Dal is very nutritious and is recommended for diabetics, as are other pulses. Though very beneficial in limited quantities excessive intake causes flatulence, which some sources claim can be prevented by adding a little asafoetida, pepper and ginger in the cultinary preparations. Note: Since my little daughter has been under the weather, blogging has been disruptinve. She is doing fine now and normal programming will resume soon. Normal might not mean frequent though.